What if I gave you a list of ten things that any church could do that would bring almost immediate renewal and growth? Would you be interested in the list? Simplify your structure by putting the authority to make most decisions related to the practice of ministry in the hands of those with responsibility. Translation: let your leaders lead. Hire young, platform young, program young. Why? You attract who you platform, and most churches are growing old. Become more contemporary in terms of music and graphics, décor and topics, website and signage. It’s 2015. Really. You can check. Stop preaching and start communicating. There’s a difference. Shift the outreach focus away from the already convinced toward those who are not. It’s called the Great Commission. Prioritize your children’s ministry in terms of money and staffing, square footage and resources. Do you really not know, after all this time, that the children’s ministry is your most important ministry for outreach and growth? Help everyone find their spiritual gifts and then help them channel those gifts toward ministry. Target men. Get the man, you tend to get the family. Proclaim the full counsel of God without compromise or dilution. All you get with a watered-down message is a watered-down church. And a watered-down church has nothing to offer the world it does not already have. Now, what if I told you that the vast majority of churches already know this list. Not only do they know the list, they would agree with most if not all of it. But they refuse to act on it. And the reason tends to be the same, in church after church, around the world: they don’t want to change. Which brings up another list. 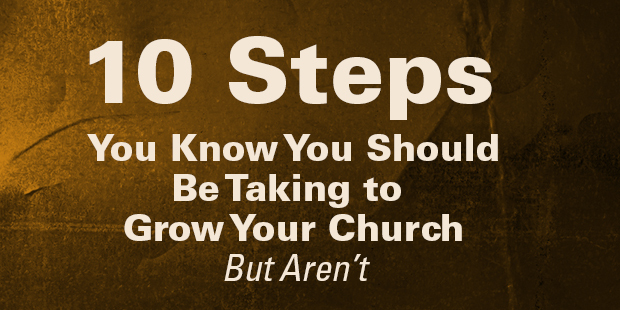 Would you like to know more how to take steps to help your church grow? Connect with an Auxano Navigator and start a conversation with our team. Niiiice. Intentional age discrimination at church.